If you’re heading to a trade show, you need custom trade show giveaways. They’re a tangible, cost-effective way to get your name in front of your audience—the majority of which are decision makers. 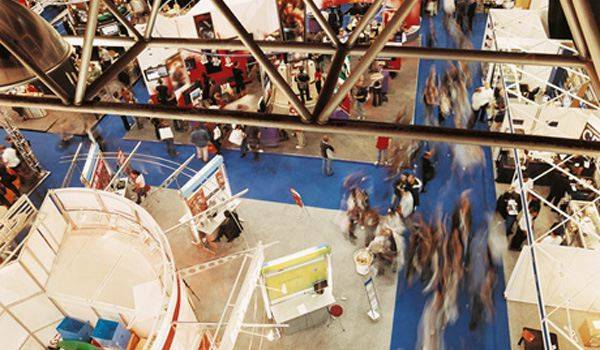 More than 80% of tradeshow attendees have the authority to influence buying decisions, and more than 50% buy something as a result of attending the show, according to a study from Exhibit Surveys. Naturally, promotional trade show giveaways are a must. They boost your company’s sales and shorten the sales cycle. You can’t afford not to use them. Your competitors certainly will be using them to woo customers and prospects. That’s just the nature of trade shows. You don’t have to blend in with all the other booths, though. You can stand out and make your company memorable with promotional items. 1. Choose giveaways that make sense for your brand. There are thousands and thousands of promotional products on the market, but that doesn’t mean they’re all a great fit for your brand. To maximize the effectiveness of your trade show giveaways, always opt for products that tie in with your brand. People need to make an immediate connection with your company and the giveaway you’ve just placed in their hands. For example, if you’re in the healthcare industry, logo hand sanitizer makes more sense than a custom lighter. If you’re in the food business, a promotional cooler bag is a better choice than a custom dog leash. Keep your promo items relevant to your brand. People flock to promotional items that are attractive, trendy and visually appealing. If they’ve never seen it before and it looks interesting, they’ll want to check it out. Plus, it shines a positive light on your brand when your logo is imprinted on high-quality, well-designed promotional products. Select trade show giveaways that have a natural appeal to your audience, and you’ll create a buzz around your booth. 3. Opt for promo items with a purpose. Novelty products are fun, but if you want your logo to stick around for the long haul, your trade show giveaways should serve a real purpose for your audience. If attendees see a value in your giveaway, they’ll hold onto it. If not, it will likely end up in the trash; people can only schlep so much stuff at a tradeshow. Make sure your giveaways are useful and fill a universal need, such as custom bags or logo drinkware. Everyone has a need for these items, which makes them more likely to be used. Don’t forget about your booth staff—you can maximize your trade show presence by dressing your trade show team in custom shirts or hats.